The table of contents should be informative, though compact enough that it is easy to conceive the wholeness and structure of the work. From the table of contents the reader can deduce the order of importance and the logic of the study. The title of the table of contents is Contents. 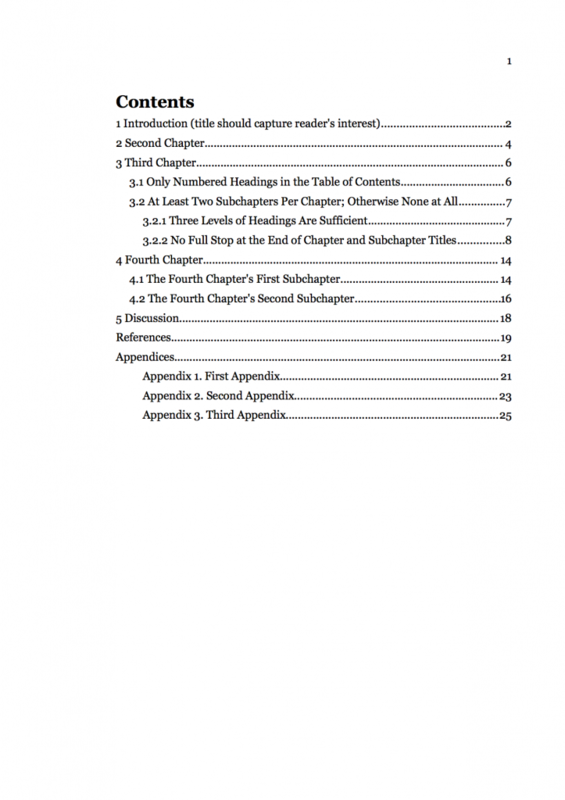 The table of contents is organised by numbering the parts as main chapters and subchapters. There is no full stop following main chapter and subchapter numbers. The titles in the table of contents must be identical to the corresponding titles in the text. The title of the thesis and of each main chapter is set in bold typeface. Other aspects of the table of contents can be freely formatted. Two levels of headings are generally sufficient. A third level may be used if deemed necessary (see Figure 1). There should be no instances where only a single subchapter is used; the main chapter title alone is permissible. The table of contents normally lists only the main (numbered) text chapters. Careful consideration should be given to how to form chapters from small parts of text, as chapters are larger entities than paragraphs. The names of appendices are included in the table of contents as subchapters of the main chapter Appendices. If there are several tables and figures in the thesis, they are presented in separate lists at the end of the table of contents. The list contains the number, name, and page number of each table or figure, but not the reference. If there are several special abbreviations and symbols in the thesis, they can be listed after the list of tables and the list of figures as an index of abbreviations.